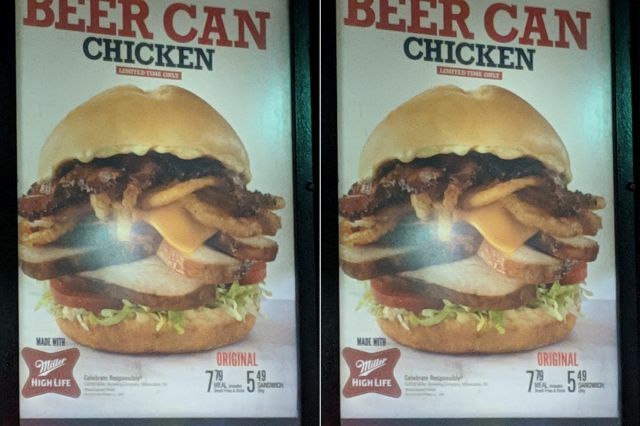 Arby's has been spotted testing the new Beer Can Chicken sandwich in at least a few locations in Minnesota. The sandwich features thick-sliced, roasted chicken marinated in Miller High Life beer prior to cooking. The chicken is accompanied by garlic aioli, cheddar cheese, pepper bacon, crispy onion strings, lettuce, and tomato on a toasted star-cut bun. The price on the sandwich is $5.49. It's also available in a combo meal with fries and a drink for $7.79. I was able to confirm that the sandwich is available at the Arby's restaurant located at: 2105 Snelling Ave N, Roseville, MN 55113. It is likely also available at other nearby locations. Beer can chicken is a method of grilling a whole chicken where a half-filled can of beer is stuffed into its cavity. Arby's would not be the first fast food chain to offer a beer can chicken-themed item. Not to long ago, Popeyes offered their own take on the dish but it didn't seem to actually involve any beer.